LAMWO – A stray buffalo from Kidepo National Game Park on Monday killed a man after it was wounded by armed policemen and locals in Paloga sub-county, Lamwo District. The buffalo, according to witnesses, was being trailed by armed policemen and locals armed with spears and bows having spent close to four days in the village, causing fear among people and domestic animals. 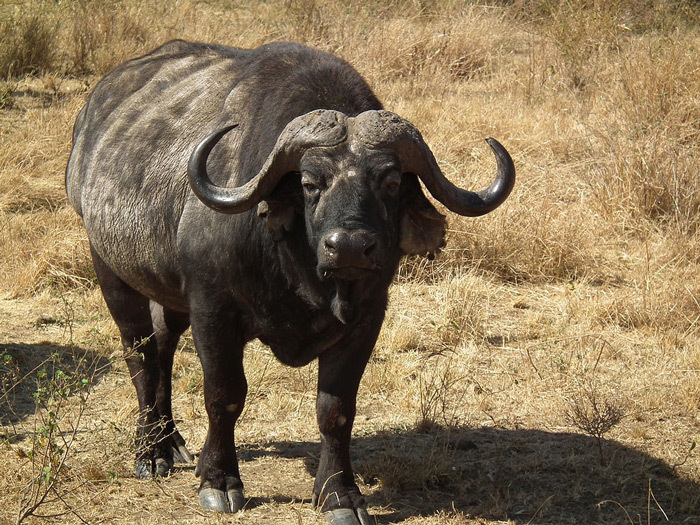 The buffalo reportedly attacked kraals and threatened residents at water points in the villages of Palaa in Padibe Town Council, Dec in Padibe East Sub County, and Keca in Paloga Sub County. The police then shot and injured the animal. However, while fleeing, it Mr stamped on a resident, shattering his head. Lamwo Town Council LCIII chairperson George Nyeko identified the deceased as Martine Ocitti, 34, a resident of Tegot Agoro village who was returning from his farmland. The District Police Commander, Mr Moses Elau, who went to the scene, confirmed the incident adding that the buffalo was also killed. The Public Relations Officer Kidepo National Game Park, Walter Odokorwot, regretted the incident. He, however, accused the locals of provoking the buffalo. “Wild animals like buffaloes are dangerous once provoked. People should desist from the vice. They should have invited us to take away the animal,’’ he said. This is the fourth case of stray buffaloes being reported in communities in Lamwo district since January 2019. UWA is currently erecting electric fences in wildlife conservation areas where there are human-wildlife conflicts.